There is an obligation on Financial Institutions and other organisations (who become custodians of clients personal information) to comply with the Privacy Act to de-identify Tax File Numbers or TFN’s, not implicitly used in conducting services on behalf of that client or held to meet legislative reporting requirements. 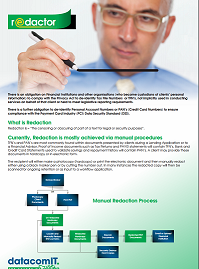 There is a further obligation to de-identify Personal Account Numbers or PAN’s (Credit Card Numbers) to ensure compliance with the Payment Card Industry (PCI) Data Security Standard (DSS). 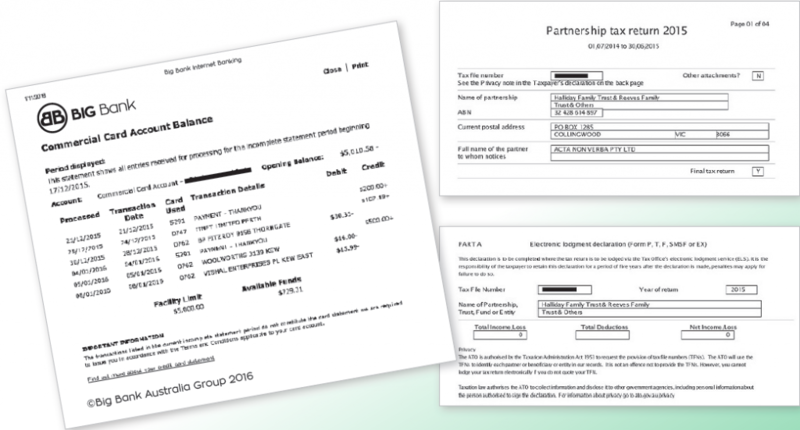 TFN’s and PAN’s are most commonly found within documents presented by clients during a Lending Application or to a Financial Advisor. 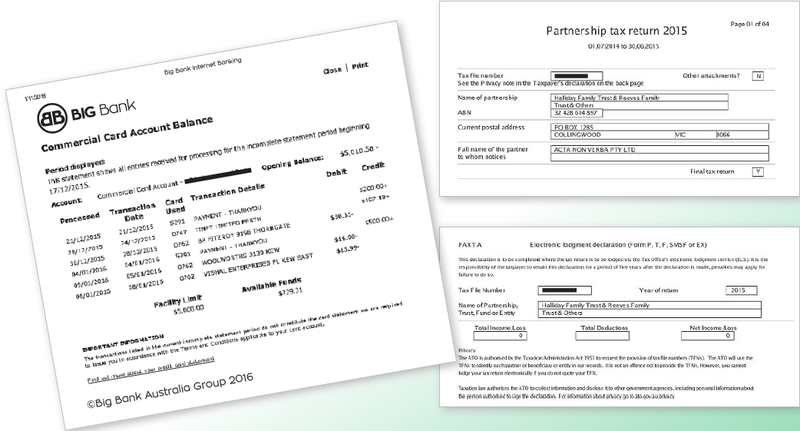 Proof of Income documents such as Tax Returns and PAYG statements will contain TFN’s. Bank and Credit Card Statements used to validate savings and repayment history will contain PAN’s. A client may provide these documents in hardcopy or in electronic form. The recipient will either make a photocopy (hardcopy) or print the electronic document and then manually redact either using a black marker pen or by cutting the number out. In many instances the redacted copy will then be scanned for ongoing retention or as input to a workflow application. The DatacomIT Redactor service receives the documents through secure communication either as the result of “scan to email” in the case of hardcopy or by emailing the existing electronic documents. Redactor will detect the receipt of an email, extract the attached document and pass it through the automated redaction software. The Redactor software will locate all instances of TFN’s and/or PAN’s and will mask the located data with either black or white filler. Once complete, the redacted document will be automatically emailed to the designated recipient. For additional information or a demonstration of our Redactor Solution, please contact DatacomIT info@datacomit.com.au or on 1300 887 507.